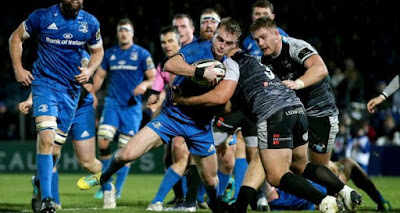 So the full time whistle blew, and Leinster fans began to pour out of the stadium into the D4 night satisfied with another impressive victory… Over fifty points for the boys in blue, just the one converted try for the Ospreys. And if they didn't know names like Ciarán Frawley, Scott Penny, Conor O’Brien & Hugh O'Sullivan at kickoff, they most certainly did now. Regular readers of this page might spot what I was doing with that opening paragraph; namely making it look like I'm harping on this match when really I'm harKing back to one from a while ago. This time the reference is to a match in Donnybrook back at the end of September when Leinster A defeated Ospreys Development by 53-7, and by the scoreline you can see how history came so close to repeating itself on Friday evening. And in an effort to “go the extra mile” for you, we put our team of crack researchers on the case to compare the matchday 23s from those two contests to see how they stack up…given both clubs were missing internationals, was it essentially a carbon copy of the Celtic Cup clash? By our reckoning there were only two Ospreys who travelled to both ‘Brook and ‘Bridge, namely scrum half Matthew Aubrey and centre Tom Williams. And it's not like they were completely without experience last Friday; James Hook has 'just' the 81 test caps, Sam Davies has quarterbacked them for a while now and Cory Allen, Hanno Dirksen and Rob McCusker are far from spring chickens in this league. Meanwhile on Leinster's side of things, as well as the four starlets I name-checked earlier, there were another five who also played in September, though to be fair we had some test experience ourselves in Fardy and Tracy, plus there was no way you could ever ignore the presence of a certain Mr J Lowe on a rugby pitch. All of which goes to show that this display and result does much to illustrate the difference between Leinster and not just the Ospreys, but also most professional rugby clubs around Europe these days. In my preview I said we'd win by about 14 points. Obviously I was way off, but let's be fair - who in their right minds could have predicted a rout like this with selections like those? And while the first ten minutes are obviously long forgotten given what happened in the last seventy, you can't write up the match without pointing out the Welsh region were in complete control literally from after the kickoff, when James Lowe (who won't thank me for bringing this up I'm sure but he more than made up for it later) boomed his exit clearance out on the full giving the visitors and attacking lineout at our 22. From there we had further little niggling errors like a poor exit box kick, knockons, getting turned over on or own scrum put in; although it was “early doors” it looked to all intents and purposes that this could be another classic example of one of the league's biggest organic rivalries. Then centre Cory Allen charged into our 22, meaning the rearguard defence of this patchwork XV was really put to the test, and 18 phases later, it passed with flying colours as Fardy reached into a breakdown to steal, we tidied and it eventually got back to Ciarán Frawley who somehow hoofed a clearance from his own dead ball line into touch 10m inside the Leinster half. From there it was like a mini curse had been lifted; we stole the Osprey lineout (first of many on the night), worked our way up the pitch and when a fancy Lowe offload put Nick McCarthy through into their 22, all of a sudden we were the ones on the front foot and this time the defence wasn't quite so resilient. After Fardy and Frawley were both involved down the other end minutes before, now the young out half was putting his skipper clean through beyond the line of tacklers, and with Conor O’Brien running in perfect support, the pass reached him just at the right time to put us ahead. For the next 20 minutes or so, we were still defending well, still pinching lineouts, still in control, yet all we could muster was a Frawley penalty so it wasn't until minute 31 that we really started to pull away, and with the second try, at least one of my match predictions came to pass. While we're looking for Penny to finish tries off lineouts tonight, keep an eye out for Conor's crash ball talents on scrums in the Osprey 22. Now I know O’Brien's try wasn't strictly 'crash ball' off a set piece but still it was that kind of line that he ran and for sure the way Penny finished the second was exactly how he did multiple times for the A side. He looks like he can do mauls off lineouts in his sleep; once a clean catch is made of course, and with Fardy and Molony in charge this was pretty much a given for us. Penny seems to have a knack for knowing both when to peel off the back and how to face whatever stands in his way to the line assuming he's not already over, and it was no surprise that this was how he got his first senior try. Another thing that might be long forgotten about this match is that the Ospreys got the ball down over our líne shortly after Penny's score, though a look by the TMO revealed their centre Kotze clearly (and needlessly I thought) hindering Noel Reid's tackling channel before Hook dotted down. With a lineout at halfway leading to phases in their 22 and another penalty advantage on the way, Nick McCarthy denied Penny the chance of a repeat score by taking it himself from the base of a ruck and doing very well to stretch out and get it down over the line. So 24-0 at the break…could this team crack on and secure the bonus point win? Just four minutes into the second half we had our answer as Fardy himself planted the ball against the base of the post after we rolled through a patient 22 phases. The Ospreys' goose was well cooked by that stage. Yet we still kept rolling on. Adam Byrne's superpower seems to be recovering high kicks from his own team. After he took one at halfway, both Fardy and Lowe (who oddly didn't score but still put himself about well after the shaky start) were involved in getting it to the line for Ed Byrne to finish; already the bench were getting in on the scoring action. The next one was arguably the pick of the bunch, as Adam Byrne again did the creating only this time by dinking one forward to recover himself before offloading to Max Deegan who cantered home. Six tries in so far; all that remained for us as a target was to get it to a ‘fifty-burger’ and with Hugh O’Sullivan impressing at scrum half from the bench, it got to Ed Byrne again near the line only here he needed to offload quickly so luckily his brother Bryan was on his shoulder to take it the rest of the way. And along with seven tries came seven conversions from Ciarán Frawley, giving him a perfect night from the tee including the penalty. Add in that long clearance at the start, impressive attacking high kicks and well-timed through passes and it's easy to see how he got man of the match. Many fans commented on social media after the match that they were disappointed the Ospreys got a try before the end to break their duck. I wasn't all that bothered by it, though I did wonder why Hanno Dirksen celebrated so much when he got it? As a coach that would really annoy me - I can't see how it could have offered much consolation to a team that should expect to be in the league's playoff picture. Even though the Scarlets also won with a bonus point on the night, this victory made the top of the Conference B table look even more ridiculous than it already did. Not only do we have a ten-point cushion over the West Walians, but the gap in our respective points difference columns is now a whopping 123 (the other five teams are all minus BTW), AND they are still to play us at the RDS. All we can do is roll in to Newport next weekend and do what we can do extend that lead further, but it's hard to argue that for all the success Leinster are enjoying right now, the future definitely looks just as bright. Later this week we'll have a competition, a guest post from Keego and our 80-word reviews on Tuesday, Harpin Points on Wednesday (we'll give the Joe Schmidt news a couple of days to settle and deal with it then), Telly post on Thursday and our Dragons v Leinster preview on Friday. Plus of course every morning our Front5 quotes & links. Do stay tuned!